Physical characteristics: Stripe-headed rhabdornises (sometimes called the stripe-sided rhabdornises) are 5.7 to 6.2 inches (14.5 to 15.8 centimeters) long, and weigh between 2.75 and 3.00 ounces (78 to 85 grams). Both sexes are colored in a similar way, but males are larger in size than females. Generally, stripe-headed rhabdornises have black bills, dark brown eyes, and dark legs. Adult males have a blackish brown crown (top part of the head) and nape (back part of the neck) with many white streaks, a broad strip through the eye, while the face and the rest of the neck are blackish brown. Adult females differ from males in having a lighter brown crown and face. Both sexes have a striated head (marked with narrow parallel bands). Geographic range: Stripe-headed rhabdornises range in the Philippine Islands of Luzon, Negros, Panay, Masbate, Contanduenes, Leyte, Mindanao, Samar, Basilan, Bohol, Calicoan, and Dinagat. Habitat: Stripe-headed rhabdornises live throughout the major Philippine Islands in tropical forests from sea level up to an elevation of about 3,900 feet (1,200 meters). They generally prefer lowland forests and second growth forests, and are usually found within the canopy or middle story of the trees. Diet: Stripe-headed rhabdornises primarily eat insects, along with nectar, fruits, and seeds found within their forest habitat. Stripe-headed rhabdornises forage (search for food) along limbs, checking crevices with their thin pointed, down-curved bills in order to remove insects from tree bark. They then use their brush-tipped tongues for the removal of nectar within flowers. Behavior and reproduction: Stripe-headed rhabdornises are very active during the day. They occupy the canopy and middle story of primary forests, forest edges, and secondary growth. Groups of the birds themselves or groups of the birds along with other bird species often flock together in numbers up to twenty-five individuals. At dusk, they usually roost in large groups of up to several hundreds of birds. The call of the stripe-headed rhabdornises is an uninteresting, high-pitched "tsee tsee WICK tsee," with the "tsee" called out softly but the "WICK" spoken sharp and loud. 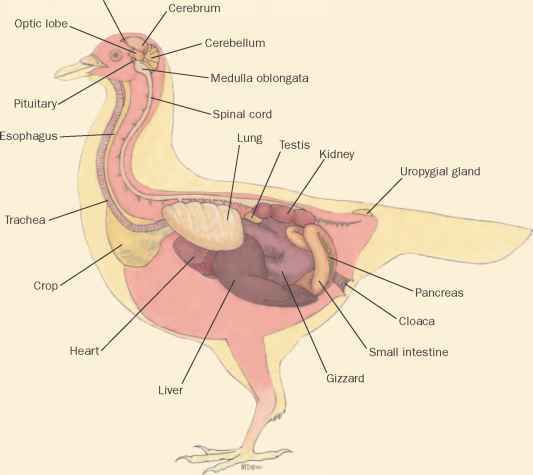 The reproduction habits of the birds are largely unknown. They are believed to nest in cavities (hollow areas) and holes of trees. Stripe-headed rhabdornises and people: Stripe-headed rhabdor-nises have no special significance to people. del Hoyo, Josep, Andrew Elliott, Jordi Sargatal, et al, eds. Handbook of the Birds of the World. Barcelona: Lynx Edicions, 1992. Birdwatch.ph. The Official Website of the Wild Bird Club of the Philippines. 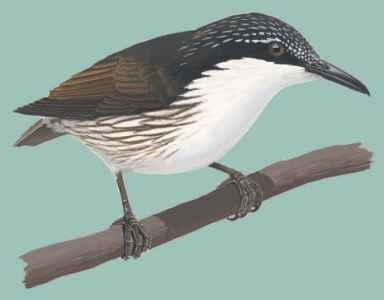 http://www.birdwatch.ph/gallery/stripeheadedrhabdornis.html (accessed on April 19, 2004). Flowerpeckers consist of the true flowerpeckers and the berrypeckers. Some researchers consider only the true flower-peckers as members of the family Dicaeidae, with the berrypeckers sometimes in dispute among scientists as to their membership in the family. All six groups of birds are very small, dumpy-looking, often brightly colored with short, usually straight bills and short stubby tails. Upperparts are dark and glossy, and under parts are lighter. In species with dull plumage (feathers), no difference between males and females occurs. In those species with bright plumage, males have patches of bright colors; those patches are missing in females. In some species, females appear duller and larger than males. They are 2.2 to 8.3 inches (5.6 to 21.0 centimeters) long and weigh between 0.14 and 2.80 ounces (4 to 80 grams). True flowerpeckers are small birds with short bills and short, stubby tails. The outer third of the upper bill is serrated (having notches). Their tongues have frilly outer edges, termed fimbriations. Berrypeckers have simple tongues, long, straight bills, and lack specializations of the gut (abdomen) that are contained in true flowerpeckers. Laos, southern China, Hainan Island, Taiwan, the Malay Peninsula, Indonesia, the Philippines, Sulawesi, the Moluccas, New Guinea and its surrounding islands, and Australia.